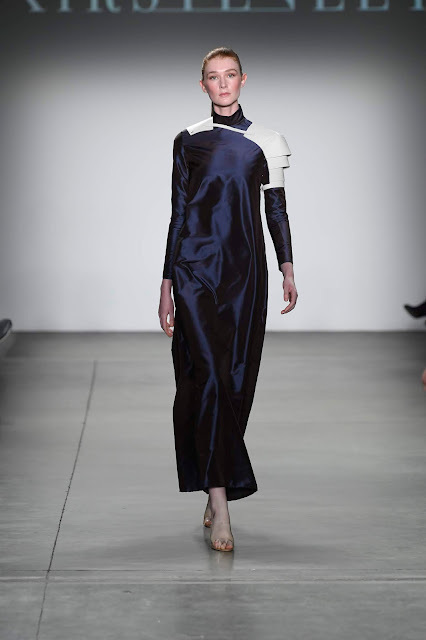 Thick structured leather, glistening silks, and opaque organza gave texture to an artistic collection by Canadian designer Kirsten Ley (Canada). ‘NAISSANCE’, representing the birth, or ‘rebirth,’ of her label as an official Parisian fashion house gave life to classical French couture techniques while maintaining modern, avant-garde silhouettes. The colour palette featured deep metallic blue with Ley’s signature crisp oxblood softened by whimsical sheer creams, manifesting the emotional dichotomy of a fragmented human psyche. Kirsten’s signature sculpting technique can be seen in a deep purple leather skirt worn with an asymmetric top with layered, gathered organza. Iridescent fabrics add shadow and light, evoking romantic escapism for the viewer.